I have mentioned before that orange vegetables have favored status with the children in our household. Which is why, when I have a butternut squash around, my first thought about dinner is usually that I should dice it up and roast it. My oldest calls the carmelized bites “squash candy,” which isn’t at all wrong (although I don’t go this far). I, however, am not picky about the color of my food, so long as my plate contains an array of stunning hues. Ok, so I am picky. It’s worth it. Beautiful tastes better. Luckily, we eat a lot of vegetables, and vegetables are gorgeous. 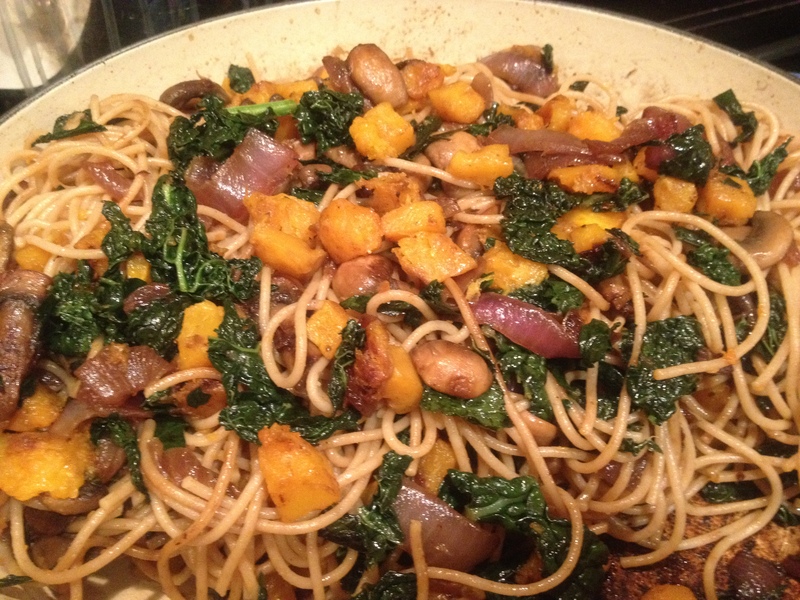 This pasta has a combination of veggies that I love for their jewel tones almost as much as I love them for their flavor together: butternut squash, kale, red onion, and mushrooms. I am not an evangelist on this point, but I think this combination is worth trying with whole wheat pasta. At this time of year especially, I like the robust savor of whole wheat noodles underlying the sweetness of caramelized winter vegetables. But hey, if that’s not your thing, go ahead and use whatever you’ve got on your shelf. Jewel Tone Winter Pasta begins with the roasting of a peeled, diced butternut squash tossed with a spoonful of olive oil and a few good pinches of salt. Roast it at 450 and stir every 10 minutes or so until the cubes start to candy at the edges (about 40 minutes for 1/2″ cubes). Meanwhile, heat a pot of water to boil pasta. While it’s heating, find a pan large enough to hold the finished dish and saute a sliced red onion in olive oil on high heat with a pinch of salt until it begins to really brown. Add a pile of sliced mushrooms and continue cooking until the liquid evaporates and they shine like gold. Now toss in a big pinch of salt and a shredded head of washed kale, with a few additional spoonfuls of water if necessary to deglaze the pan, and cook until the kale is tender but not mushy. 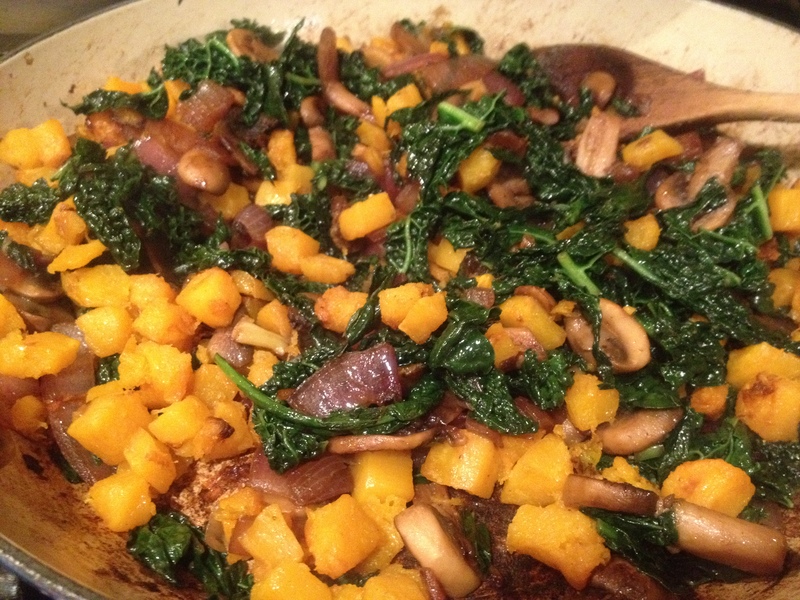 (Take the pan off the heat if your pasta and squash aren’t ready yet.) When your squash is nearing perfection, cook whole wheat spaghetti (or your noodles of choice) in salted water for 1 minute less than usual and then drain, reserving a cup of cooking water–the pasta will finish cooking in your pan. Put your pan back on the heat and combine everything: sauteed veggies, roasted squash, noodles, a splash of olive oil and some good grindings of pepper. Taste for salt and serve with more pepper at the table, and a little bit of cheese if you’re so inclined. I love this dish with blue cheese, but fresh goat cheese or grated parmesan would be perfectly acceptable alternatives. We served this pasta with a spinach salad with fresh pears, dried cherries, sunflower seeds and Creamy Pear Vinaigrette, but it would also be delicious with this lemony Romaine salad with homemade croutons. This entry was posted in Noodles, Vegan or Would-Be-Just-As-Good-Vegan and tagged children, cooking, dinner, food, kale, lifestyle, pasta, recipes, vegetarian on January 30, 2012 by emmycooks. Great name for this beautiful dish! I’m a big fan of this flavor combination, too. Are you using curly leaf kale or lacinto? I used lacinato. But use what you have! From a color perspective, curly green kale or purpley Red Russian would be lovely too.